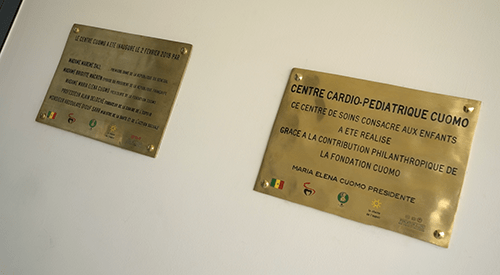 The Cuomo Centre in Dakar was inaugurated on Friday 2 February 2018. The official inauguration ceremony of CCPC was held in the presence of the First Lady of Senegal, Mrs Marème Sall and her guest of honour, Mrs Brigitte Macron, wife of the President of the French Republic. Mr Abdoulaye Diouf Sarr, Minister of Health, Dr Cheikh Tacko Diop, CHNU Fann Director, Mrs Maria Elena Cuomo, Chairwoman of the Cuomo Foundation and Pr Alain Deloche, Founder of La Chaîne de l’Espoir also participated in this ceremony together with Mr Youssou N’Dour, Minister-Advisor of the President of the Republic of Senegal. The Children’s Pavilion, adjoining the Cuomo Centre, will also open its doors. It will ensure the postoperative monitoring and convalescence of the children with heart disease coming from the subregion who will be operated on at CCPC. This inauguration is the fulfilment of a durable and sincere commitment of La Chaîne de l’Espoir in Senegal to help sick children.